Jennifer Tyler Lee is the creator of the award-winning game Crunch a Color™. She lives in the San Francisco Bay Area with her family. "Looking for ways to encourage your kids to eat nutritious food without instigating a power struggle? Lee (creator of the game Crunch a Color) offers an exciting strategy to introduce children to fresh foods and involve them in cooking. She opts for a game-based approach where kids earn points for the different types of foods they eat. The plan is structured to introduce 52 new foods over the course of 52 weeks. Families can prepare the meals together and experiment. Provisions are listed seasonally, such as sweet potato (fall) and peas (spring). The author emphasizes the importance of children learning to cook, having a garden (home and school), and going to farmers markets. One can also choose to journal, use photographs, or blog to chart what works and what doesn’t. Many of the included recipes are side dishes such as roasted purple cauliflower and wild rice with pomegranate and pistachios. Using games/rewards in conjunction with food can be risky business, but Lee’s method is lighthearted. VERDICT A fun way to engage children in creating meals and trying new things." "In these days of hand-wringing about how our kids' eating habits have gone down the tubes, Jennifer Tyler Lee is stepping up and giving us parents something positive to do to. Her solution-based book is filled with thoughtful advice, surprising nuggets of information, and most of all a welcome dose of proactive optimism." 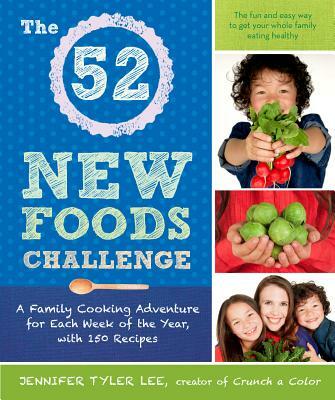 "The 52 New Foods Challenge is quickly becoming THE resource guide for inspiring my kids to eat the full spectrum of foods." "Invites kids of all ages into the kitchen to cook, and gives them exactly what they need to get excited about kale, salmon, and quinoa instead of pasta, pizza and other “kid food.” Jennifer Tyler Lee has planted the seeds of comfort and confidence in the child’s kitchen." "A year from reading this book, the fact that your family is eating healthier will be a symptom of something far deeper. The food will have been a delicious prop, an opportunity to think and communicate differently. That’s what makes Jennifer Tyler Lee’s book so valuable. If it helps, think of The 52 New Foods Challenge is a delicious blend of Dr Spock and The Joy of Cooking for 21st century foodie parents. But it’s much more than that"
"Fun? Simple? Rewards dinner conversation, good manners and setting the table? Encourages even the most reticent child—or adult!—to eat their veggies? Supports non-profits dedicated to combating the childhood obesity epidemic? You can see why we love this." "A simple, fun and playful way to get kids to eat healthy and try new foods."